Through engaging advocacy around the recent resurfacing of blackface and eugenics, I have been reminded of the College’s ongoing love affair with antiblackness. Occidental should be upfront and transparent, rather than privilege the desires of elite and wealthy families tied to the College. How could we invest the Crosthwaites’ donations in reparations rather than using fiscal logics that afford the institution perpetuity? How might we take a principled loss — an action where we forfeit the professional, financial or cultural benefits of preserving the status quo in order to stand by a set of collective principles? When did 1984 become the year where anti-Black violence was “normal for the times” in the white imagination? At what point do “conversations” that we need to have turn into “conversions” associated with tangible plans? How would those most affected by antiblackness be at the center of these plans? Make no mistake about it: Occidental was founded in 1887 around a specific mission. This mission quickly manifested as the elite, exclusive and violent institution that many today boldly accept as being “normal during those times” — and thus worth reflecting on and addressing. Ethically, Occidental never had the right to exist, nor should it be spoken about as some legitimate long-term project worth salvaging as time goes by. Antiblackness was as normal in 1887 as it is in 2019. Its essence is central to the way the College continues to exist in “perpetuity.” The methods by which we have grown and accumulated wealth in our endowment, claimed and distorted land originally occupied by the Tongva and continuously committed to the idea of “prestige,” among other things, are all anti-Black. For clarity, antiblackness in this context is not simply the experience of a racial category (although it’s certainly marked by that, too) but rather the cultural, economic, political and historical position of “non-being and non-human.” This can be observed in our campus life, as Black bodies experience terror in yearbooks, summer programs and ceremonies without cause. This violence is gratuitous and unwarranted, as Afro-Pessimist scholar Frank Wilderson III puts it. This persistent reality for Black students has always been in contestation with the College’s “neoliberal multicultural imagination.” Simply put, in the 1980s there was a concerted effort by local and federal government to put laws and other measures in place to tackle years of blatant racism after civil rights shifts of the late 1960s. Folks later became fixated on changing racial and ethnic demographics of various markets and consumer bases, which led to the idea that governments could depend on markets to address issues of race and racism. The philosophies and terminology we use today, such as diversity, inclusion, multiculturalism and equity, are all riddled with neoliberal ideas. Many students of color — a phrase also utilized in neoliberal ideology — come to Occidental and buy in, literally and figuratively, to the idea that the College will be, at minimum, a buffer zone to anti-Black violence on their way to a secured position in the middle class. This is likely due to the mission and brand of Occidental. If we were honest, we would acknowledge this possibility does not and will never exist. If you’re hungry for an example, look no further than the recent email students from the Multicultural Summer Institute 2018 Cohort sent out regarding Occidental’s oppressive history alongside its present-day mismanagement of the program. 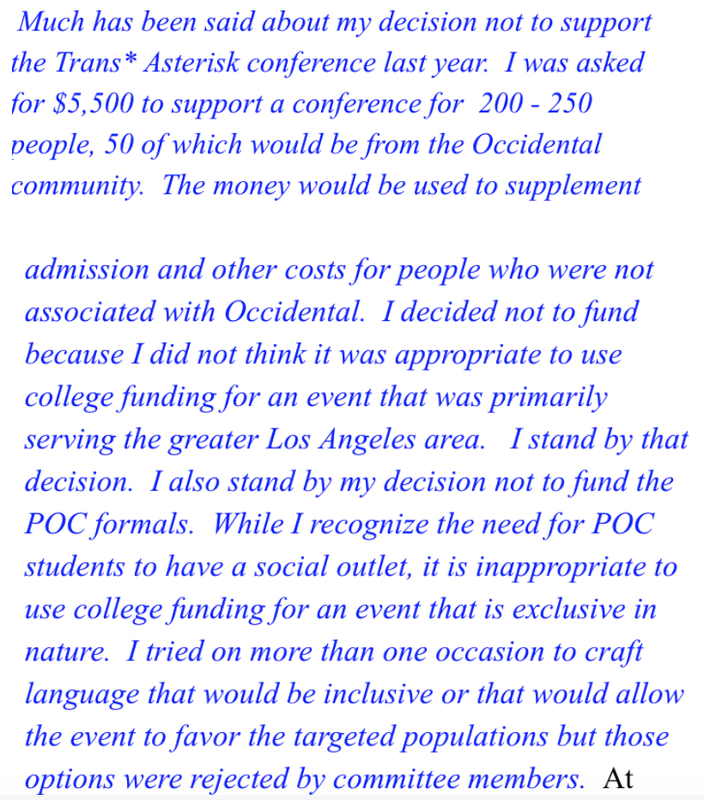 As ASOC President, I became privy to our VP of Diversity and Inclusion Rhonda Brown’s prompt rebuttal to claims made in the letter. Brown’s text is in blue. Here, Brown insists on highlighting that this is not a story specific to Occidental (would it only matter then?) and undermines the cohort’s position by citing the College’s role in the educational journey of Barack Obama. For those aware of political discourses on the left, this carries its own irony; regardless, this rebuttal highlights the lack of critical thinking and investment in addressing antiblackness at Occidental. In this section of the rebuttal, Brown expresses apprehension around using college funding for an event that was primarily serving the greater Los Angeles community. This is a bizarre response given that the College touts a priority of community engagement. If Occidental was to adopt this fiscal position institution-wide, what would that mean for Los Angeles’ residents who could benefit from our resources? Additionally, Brown co-opts language of inclusivity and exclusivity, weaponizing it against students of color in regard to her decision not to fund POC Formal. These are examples of the failures (or successes) of the neoliberal mission and aim of the College. All of its leadership is implicated, not just personnel formally responsible for “diversity and inclusion” — but certainly them, too. Not surprisingly, the professional roles at the College are all built around false possibilities. Regardless of one’s feeling about the individuals who occupy those roles, how could a VP of Marketing ever truthfully convey our realities in ways that keep it profitable to a wide range of stakeholders? How could a VP of Student Affairs ever completely aid students organizing to tear down the institution down one ugly part at a time? How could a VP of Diversity and Inclusion avoid reinforcing the neoliberal multicultural idea and shy away from buzzwords and symbolic gestures? The harm is even embedded into the College’s structure. Even still, I remain imaginative. I wonder how we would have responded if there were leadership development opportunities for Black students and tools to equip us to organize effectively. I wonder how a robust Black Studies space might have helped us respond to this moment with theory and action. I keep all possibilities in mind. I still wonder how long everyone will acknowledge that antiblackness was our “past” and is our “present,” without owning that it will be our future, too — and that this truth should radically alter one’s approaches to carrying out the mission of Occidental. Perhaps the best thing we can contribute to is principled loss and to the end of this all. Jacques Lesure is a senior Resistive Education in Theory, Research and Policy major (IPS) from the east side of Atlanta and serves as ASOC President. He can be reached at jlesure@oxy.edu.